"Like" token, awarded by mmodell. "Love" token, awarded by Elitre. "Like" token, awarded by Pine. "Like" token, awarded by fbstj. Hold a succesful pilot of Discourse on https://discourse.wmflabs.org/ as an alternative to wikimedia-l mailinglist. This is a tracking ticket. Please create a ticket for anything that blocks discourse.wmflabs.org to be a succesful pilot as an alternative to wikimedia-l mailinglist. # Single Sign On (SSO): someone with a Wikimedia account should be able to sign in to Discourse with that account (just like Phabricator); or "OAuth integration with MediaWiki credentials." AdHuikeshoven raised the priority of this task from to Needs Triage. 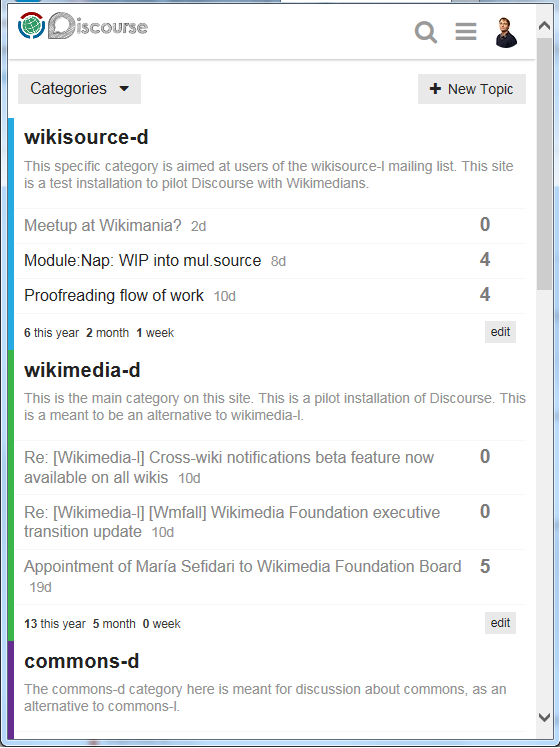 AdHuikeshoven added projects: Wikimedia-General-or-Unknown, Tracking-Neverending. 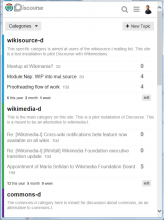 AdHuikeshoven renamed this task from Succesful pilot of Discourse on http://discourse.wmflabs.org/ as an alternative to wikimedia-l mailinglist to Succesful pilot of Discourse on https://discourse.wmflabs.org/ as an alternative to wikimedia-l mailinglist. No, moderators have quite limited rights, they are more similar to wiki Administrators than sysadmins and have no control over system upgrade and configuration. Furthermore the role of moderator can be restricted to single categories. You can see this thread for a more detailed discussion. Yes, that is true. In the english interface instances of 'badge' have been replaces with 'barnstar' (most of them). The equivalent hasn't been done in other languages. to sum up: if you want to reach people, reach them where the are already, do not invent something new which is worse than everything else used. something like facebook, posting, liking, voting, etc would be nice. if we want to improve mailing lists, expanding mailman seems much more appropriate. +1, is much better then mailman. You now have the mailman list called "discourse" to test syncing. https://discourse.wmflabs.org seems to not be working at the moment ("504 Gateway Time-out"). It's up again now (but only recently I think?). The instance has been inactive for several months now (cf. 159, home page), so the assessment/experimenting phase seems over. If this is going to be closed, then I guess the subtasks should also be closed as invalid? And the discourse installation updated to say that it's over (and maybe set to readonly)? Closing as invalid does not seem to make much sense. Either the pilot is done (and I'd rather leave it to @AdHuikeshoven to decide that), in which case the task can be resolved (and child tasks might get declined or kept open depending on the outcome of the pilot); or it's not done, in which case it can be kept open. I contributes to Discourse features continuously as well as an Wikimedia User Group China. If you'd like some connections to Discourse team or technical problems, feel free to mention me. Discourse advocates might be interested in the possibility to use it in Wikimedia to handle developer support -- see T155678#3728874. As far as I remember, Discourse has a PHP SSO example. It will be super easy to use. But it doesn’t have Unicode username support.